Many of us has stayed in hotels and motels while on business or vacation. 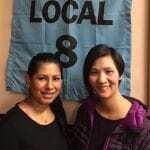 Natalie Kelley, Organizer with Unite Here Local 8 spoke with a hotel housekeeper who cleans up after our visits, Yen Deng. Deng describes what she faces while on the job. Union hotel housekeepers are known to have quality and affordable health coverage, but in a study of hotel workers by Puget Sound Sage, 97 percent reported that they suffer work related pain.